Are you man enough for #DateInABox? It's Feb. 11. You know what that means? There are only three days left until Valentine's Day! Oh, and it also means you'd better have solid dinner plans for Friday night, because all the good reservations filled up months ago. But what if, between the Super Bowl and the Olympics and constantly shoveling snow, you forgot to make plans? Heineken has you covered, thanks to a new social-media campaign devised by Wieden + Kennedy in New York. All this week, you can tweet at @Heineken_US to request a #DateInABox—which is a red, glittery vault containing a certificate for a prearranged date for two. (Examples include "a jujitsu lesson for two, couples' tattoos and an improv class." That's what you get for not thinking ahead.) 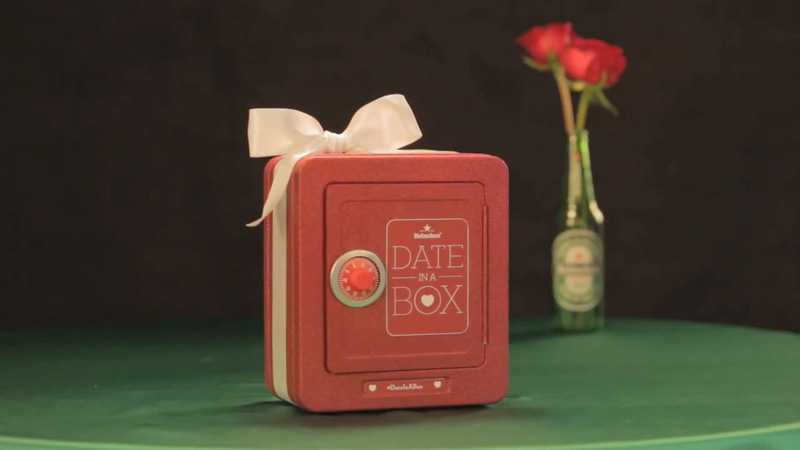 There's a catch, though: In order to get the code to unlock the vault, the guy in the relationship must publicly share a picture of the #DateInABox on Instagram. If that doesn't sound like much of a "catch," that's because you, dear reader, are probably a lady. According to Heineken, ladies are all about declaring their love on social media. (That is, if a heavily filtered photo of you and your significant other of two weeks with the caption "MY BF ILYSM" counts as a declaration of love.) Dudes, on the other hand, are loathe to share their romantic sides online for fear of letting their bros know that they are, in fact, total softies. So, forgetful men of the world, that leaves you with an important choice. Admit defeat and stay home alone on V-Day, or risk your social media cred by accepting Heineken's offer. If neither sounds appealing, you could always try to steal someone else's dinner reservation. There are probably a few John Smiths on the Cheesecake Factory waiting list, right?